Espectacular estudio situado en la playa! Vista a la ciudad, una gran vida nocturna, restaurantes, boutiques y deportes al aire libre! Estudio moderno hermoso situado en la playa en el corazón del Condado, San Juan. Con vistas a la ciudad, a poca distancia de restaurantes, tiendas, hoteles, casinos, hospitales, bancos y supermercados. Cocina totalmente equipada, con todos los utensilios y electrodomésticos necesarios. Baño recién moderno, pequeño sofá con capacidad para 2, cama king size, sábanas y toallas. Aire acondicionado, altavoces BOSE, WIFI y persianas filtrantes. Cancha de tenis, parking, seguridad las 24 horas, acceso al edificio está restringido a los invitados con llaves. Fuera del nivel del lobby hay servicios de lavandería acuñada, máquinas expendedoras y acceso directo a la playa. Fácil acceso a las autopistas y un corto viaje al Viejo San Juan, disfrutar y explorar la vieja arquitectura español, galerías de arte, museos y restaurantes! Baño recién reformado moderno Pequeño. Estacionamiento con seguridad designada y seguridad 24 horas. A poca distancia de restaurantes, hoteles y hospitales. Thank you kindly for your review! It was a pleasure having you stay in our studio! Nancy was very responsive and the apartment was perfect. I will stay here again. Thank you kindly for the wonderful review. We look forward to having you return! Happy 2019! Thank you for your kind & wonderful review! We truly enjoyed having you and look forward to your return! Great Place to stay and to enjoy beach and pool. Made Breakfast at the Studio and enjoyed dinners at local Restaurants on Ashford. Everything with in short walking distance close to Supermarket and Dining options. Great place to stay. Especially nice to have Beach chairs to use. 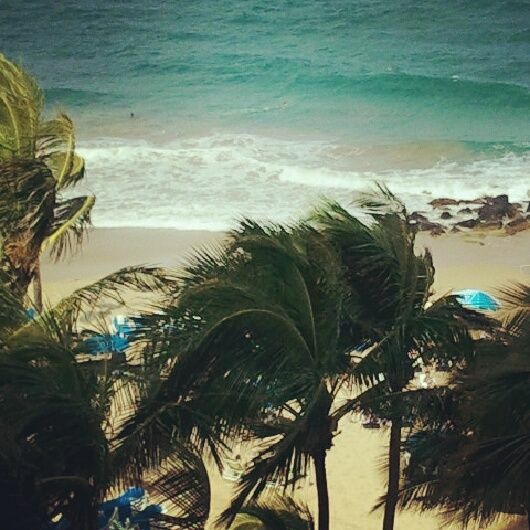 Our experience in Puerto Rico was one of the most relaxing and enjoyable vacation we have ever taken. Thanks in large part to Nancy we were able to enjoy our stay feeling that we had borrowed the beautiful home of a gracious friend. She made herself available to us for every question or need throughout our trip and people on the ground were super helpful as well. We will be back to stay with Nancy. Thank you so much for your review! We look forward to having you both come back to Puerto Rico. It was a truly a pleasure! We were greeted by Lorena and her husband who manage the property when we arrived. There was a bit of a language barrier, so don't expect a lot of conversation if you don't speak much Spanish. The property as a whole was a little out-dated, but Nancy's condo was recently updated and very modern. The unit was quiet and we rarely heard or saw anyone in the hallway. The pool was massive with an impressive deep end. It's also heated, which with cool nights, was a big plus. The beach was easily accessible, but be warned, you can't reenter after 7 p.m.! We had to walk around. We rented a car (not needed), so we utilized the provided parking space. The lot is gated with a security guard on duty, so that made us feel even safer. Nancy provides Netflix, so when we settled in at night we were able to watch whatever we wanted. Only real complaint we had for Nancy's unit specifically was the hot water. The shower was warmish and the kitchen sink had no hot water. I could (and should) have contacted someone to find out if there was a way to solve this, but ended up just making do. Would recommend resolving this before you begin your stay, either with Lorena or contacting Nancy. The condo sits right on Ashford, which is the main drag for Condado. There were lots of restaurants, a few bars and hotels along this strip - all walking distance. It was easy to walk to the Marriott to get picked up for excursions. Thank you for the feedback! We always strive to provide comfortable accommodations to our guests. I wished we had known about the hot water so that we could of check to find out what the problem was. It could of been something very minor. We hope you had a great vacation and enjoyed our enchanted island! Situado en una zona turística. A poca distancia de los principales hoteles, restaurantes, casinos, parques, boutiques, corto viaje a Plaza Las Américas (Centro Comercial) El Centro de Convenciones de Puerto Rico (4 millas) de la Universidad de Puerto Rico Jardín Botánico, Caribbean Cinemas Bellas Artes (4 millas), La Placita (2 millas) de un lugar fantástico para la vida nocturna y restaurantes! *FULL WEEK (7 nights) *Check- In - 4:00 p.m *Check-Out - 11:00 *Security Damage Deposit $250.00 shall be refunded within seven days of checkout date provided no deductions are made due to damage to the property or furnishing, the need for additional cleaning or any cost incurred by homeowner due to Guest's stay. Any damages over $250.00 will be the responsibility of the guest to pay. No smoking allowed and a $250, penalty charged will be imposed to the renter/guest. *No pets of any kind allowed. * Tax Rate..............................7% Puerto Rico has a Room Occupancy Law *Full payment and security damaged deposit is required once reservation is completed. *Rates are subject to change until reservation is complete. *Cancellation policy-100% if canceled 60 days prior to check-in date. No exceptions made to the cancellation policy. *Must sign rental agreement. Must respect and abide by all Condo rules and regulations. *We do not offer monthly rates.